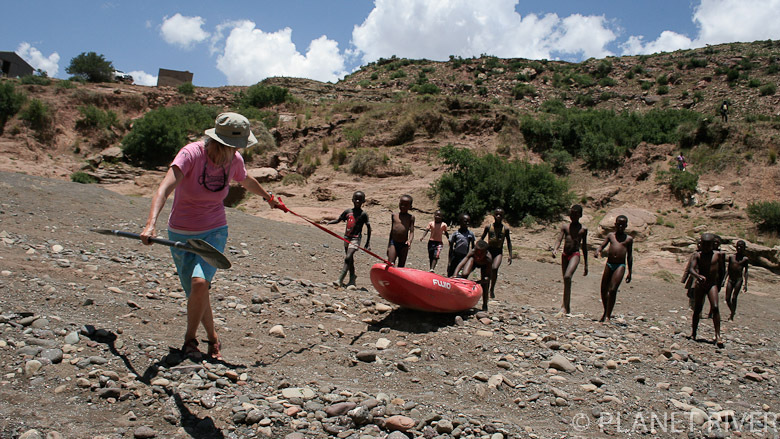 A seven-week fact-finding expedition to travel the length of the Senqu-Orange-Gariep River. A road and river journey to document by photo, video and pen the accessibility, accommodation facilities, infrastructure, river features, transport routes, distances and logistics to determine viability, useful information, and the rights of future river users, by identifying sections of the river suitable to their skill level and preference. ... and away we go ! An unusual choice of direction for an expedition on a river. River levels, dam levels and the approaching summer storms were the determining factor for this choice. With a tight schedule this was asking for a lot. We wanted to catch the higher volume lower sections, Augrabies Gorge and Onseepkans Gorge between 100 & 200 cumecs. We plannedto arrive duringthe peak of the rain season on the lower volume upper sections, upriver of Aliwal North and in Lesotho, It all worked, almost perfectly, except for the peak of the summer storms we wanted at the source arriving a week late for us. Other than being a tough and slow end to have river-hiked our boats the first 40km of the SENQU.ORANGE.GARIEP river system, it was an incredible way to document and take it all in. At the confluence of the Thlanyaku, the rains came and we paddled the sixty kilometres to Mokhotlong on a growing silt-laden current. ... still going ! Returning the vehicle on the 27th January 2010 after heading directly from our mission up to the source and setting up camp 49 in the Mercedes-Benz showroom, we were suddenly daunted by the presentation breakfast we had agreed to do the following morning. Our biggest concern was what to wear. The last 7 weeks we had been living a nomadic life where a shower, clean clothes and chatting to city executives were a distant realm. What struck us most at the presentation - aside from the ironed shirts, was the enthusiasm we instilled in the guests present for their day ahead. Smiles, chuckles and `oohs and wows and aahs ´at our exploits of bombing down waterfalls, shots of pristine scenery and tales of our adventures. We can only believe they headed back to their offices, cars and traffic and did no work for an hour or so as they reflected, or attacked their next project, e-mail or meeting with gusto. To an end, come all good things.